Give a butterfly a happy memory with this playful scarf and headband, suitable for wearers of all ages! 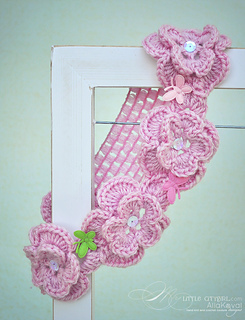 The layered floral motifs are crocheted in one piece with minimal joining and weaving, making this an easy and fun pattern. The scarf can be made using a wide range of yarn weights, from sport to medium and bulky weight yarns, for any season or occasion. Work it in jewel tones or pastels, in solid colors or softly variegated shades for a one-of-a-kind accessory. Trim it as you wish with tiny leaf appliqués, sparkling beads, glittery sequins, or with a myriad of miniature butterflies to delight the eye. 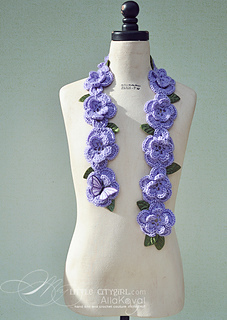 You can also wear it with one or more pins made from my free Papillon pattern. This pattern is very versatile. Try making a bracelet by using a stretchy yarn and create a tube or crochet flat and secure with a nice button or jewelry findings. 3” (7.5 cm) DK: 2.5” (6.5 cm) wide by 33” (84 cm) long (without leaves). 3” (7.5 cm) DK: 2.5” (6.5) wide and 19” (48 cm) in circumference (unstretched). shown: Cascade Yarns Pacific (40% superwash merino wool, 60% acrylic; 213 yd 195 m/3.5 oz 100 g) #26 lilac - 1 skein. 1 motif = 3” (7.5 cm) DK: 2.5” (6.5 cm) in diameter.